Cardiac resynchronization therapy (CRT) is commonly used in adults with heart failure due to dilated cardiomyopathy (DCM) with the left bundle branch block, but is not widely used in children. A 15-year-old female patient was admitted to our ward with exhaustion, weakness, fatigue, and edema. She had a prosthetic aortic valve replacement 9 years ago. She developed atrioventricular (AV) block in the postoperative period and a single chamber pacemaker was implanted then. On admission, she had NYHA class 2-3 symptoms; chest X-ray showed cardiomegaly [Figure 1]a, and electrocardiogram (ECG) had pacemaker rhythm and complete left-bundle block. Transthoracic echocardiography showed dilatation of left ventricle and left atrium, normally functioning prosthetic aortic valve, and LV systolic dysfunction. Left ventricular end diastolic diameter (LVEDd) of 6.17 cm with ejection fraction of 25% [Figure 2]a. The patient was started on medical treatment. During the follow up there was no improvement in patient's status despite medical therapy, and there was deterioration of her clinical situation. She was enlisted in the cardiac transplantation list. Meanwhile, CRT was considered. Under local anesthesia by using Seldinger's subclavian technique and bipolar passive fixation method, unipolar and bipolar electrodes were implanted to the coronary sinus and the right-atrial appendix, respectively. No intervention was done to the already implanted bipolar electrode in the right ventricle. The old pacemaker was taken out by opening a subcutaneous pouch and Biotronik Stratos LV generator (Biotronik Inc. Lake Oswego, USA) was inserted and programmed to the DDDR (CRT-P) mode. The lead parameters were satisfactory and the ECG improved. During follow up, patient improved remarkably. Cardiomegaly improved [Figure 1]b. As transthoracic echocardiographic examination showed end-diastolic dimensions of the left ventricle 4.8 mm and ejection fraction was 52%, [Figure 2]b. After 1 year of follow up patient was dropped from cardiac transplantation list. Ventricular dysfunction after chronic right ventricular pacing may improve with CRT. In 2006, Moak et al. reported severe left-ventricular dysfunction in 6 (7.5%) of 81 patients paced for complete heart block. In their study patients best responded to CRT were those who had DCM after implantation of the pacemaker to the right ventricle. The experience of CRT in children and adolescents is limited to case reports and a few studies. ,, Most use percutaneous CRT with coronary sinus canulation although surgical placement is sometimes required. The heterogeneous patient population, technical limitations from patient size, vascular access issues, and unique forms of ventricular asynchrony encountered further obscure the selection of potential beneficiaries. It is not clearly known whether pediatric experience is different from adults, but the technical issues are clearly important. Dubin et al. reported 23 acute adverse events in 20 pediatric patients. There were five reported coronary sinus lead issues, including one instance where the coronary sinus could not be entered with the pacer lead secondary to the small size. Delayed adverse events were also three reports of coronary sinus lead dislodgement, one lead adaptor malfunction, one pacer site infection, and three arrhythmic episodes. CS lead issues were found in 18% of patients who received transvenous systems, which is somewhat higher than what was found in the Multicenter Insync Randomized Clinical Evaluation trial (12% for dissection, perforation, or lead dislodgement). The high adverse event rate of 29% appears comparable to the experience with adults. Our patient showed very significant subjective and objective improvement. CRT in children should be considered more frequently. 1. Moak JP, Hasbani K, Ramwell C, Freedenberg V, Berger JT, DiRusso G, et al. Dilated cardio-myopathy following right ventricular pacing for AV block in young patients: resolution after upgrading to biventricular pacing systems. J Cardiovasc Electrophysiol 2006;17:1068-71. 2. Janousek J, Tomek V, Chaloupecky V, Gebauer RA. 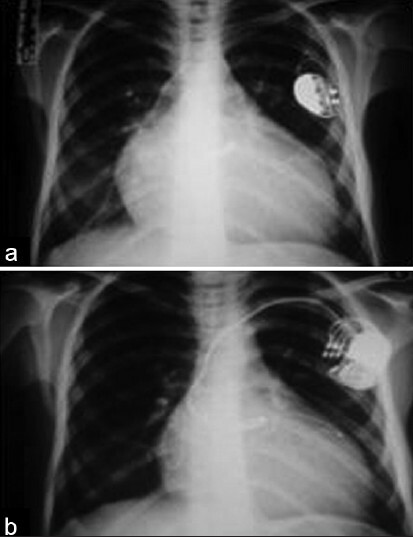 Dilated cardiomyopathy associated with dual-chamber pacing in infants: improvement through either left ventricular cardiac resynchronization or programming the pacemaker off allowing intrinsic normal conduction. J Cardiovasc Electrophysiol 2004;15:470-4. 3. Tuzcu V, Bodtke JP, Best TH. Early detection of regional myocardial dysfunction in paced children with congenital complete atrioventricular block. Pacing Clin Electrophysiol 2007;30:764-71. 4. van Beek E, Backx A, Singh S. Cardiac resynchronization as therapy for congestive cardiac failure in children dependent on chronic cardiac pacing. Cardiol Young 2006;16:187-9. 5. Dubin AM, Janousek J, Rhee E, Strieper MJ, Cecchin F, Law IH, et al. Resynchronization therapy in pediatric and congenital heart disease patients: an international multicenter study. J Am Coll Cardiol 2005;46:2277-83. 6. Abraham WT. Cardiac resynchronization therapy for heart failure: biventricular pacing and beyond. Curr Opin Cardiol 2002;17:346-52. 7. Bhatta L, Luck JC, Wolbrette DL, Naccarelli GV. Complications of biventricular pacing. Curr Opin Cardiol 2004;19:31-5.